When Shadle Park High School senior Cindy Mendoza is faced with a challenge, she doesn’t view it as a setback, but instead as an opportunity. “I tell people despite your challenges in life, you can rise above it,” she said. Mendoza, 17, learned her unique drive to achieve goals with education, hard work and perseverance from her mother, Denise Seachoque – a native of Colombia who began working at a young age to help support her family. Mendoza epitomizes Shadle Park High School’s concept for students to strive to be their best, said Julie Lee, principal at Shadle Park High School. Mendoza’s parents migrated to the U.S., where she was born. However, her father left when Mendoza was about 1 year old. Her mother, Seachoque – who didn’t know English and didn’t have family nearby for help – suddenly had to figure out how to make a living in foreign place with five children. Seachoque learned English, learned to drive and obtained citizenship. 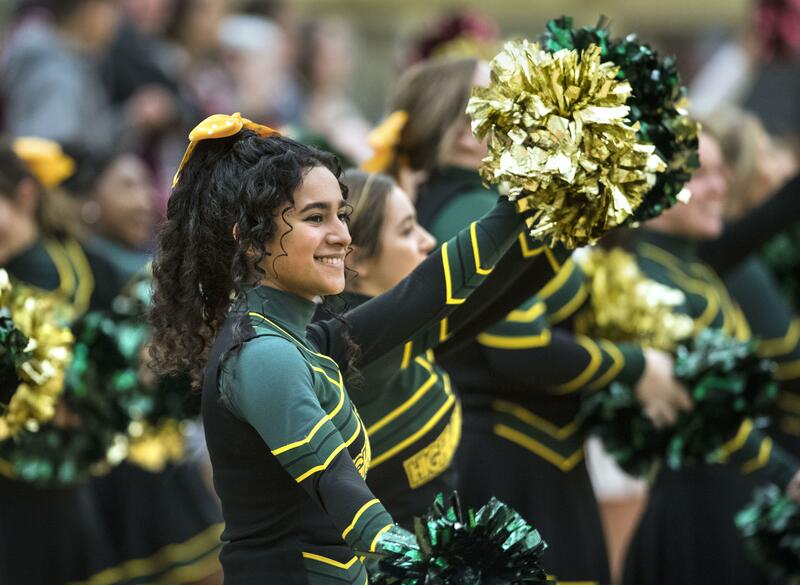 Now, Cindy Mendoza participates in cheerleading, orchestra club and volunteer work, and she tutors Glover Middle Schhol and Shadle Park students in geometry, algebra and biology. Mendoza – who is enrolled in the Running Start program at Spokane Falls Community College – wants to pursue a career in music and vocal performance. Next semester she plans to take courses in music theory, barbershop quartet and choir to prepare for acceptance into a vocal performance bachelor’s degree program at a university. Mendoza is primarily a self-taught vocalist, but for the past two months, she’s been using funds received from tutoring to pay for voice lessons. She practices German, French and Italian classical songs for about 45minutes to an hour each day and would like to learn piano. Even though Mendoza experienced setbacks – such as limited access to transportation or funds to take music lessons – she doesn’t let it get her down. The Running Start program is good for Cindy, so she can get a jump start into college, shaving some of the cost, Lee said. Mendoza said her mother works six days a week and has held two to three jobs simultaneously. As a result, they don’t see each other much. But Mendoza is thankful for her mother’s sacrifice to provide for the family and thrive in the United States. Mendoza’s mother wishes she had more time to spend with her daughter. Mendoza said one day down the road, she wants to give back to her mom and others. Published: Dec. 21, 2017, 3:02 p.m. Updated: Dec. 21, 2017, 10:31 p.m.